If you have questions about the services of our neuropsychologists and psychologists, you can contact us by telephone (local 203-271-3809, toll-free 877-788-7822) or email (cns@clinicalneuropsych.com) and we’ll get back to you as soon as possible. Or simply complete the form below to contact us directly from our Web site. Thank you! Note: Email is not a secure means of communication. Please do not send confidential patient communication via email. Use telephone instead. If you want to become a patient at CNS or would like to schedule a consultation, completing our online Patient Information Form will save you time when you come to the office. From points East (New Britain/Hartford/Manchester), take I-84 West to Exit 27 (I-691). Proceed for 1.1 miles on I-691 to Exit 3. Turn right at end of exit onto Route 10 South. Proceed straight for 5.6 miles on Route 10 to Country Plaza on the right. Refer to directions below from **. From points North (Hartford/Springfield), take I-91 South to Exit 18 (I-691). Proceed on I-691 toward Waterbury to Exit 3 (Cheshire). Turn left at end of exit onto Route 10 South. Proceed straight for 5.6 miles on Route 10 to Country Plaza, which will be on the right. Refer to directions below from **. From points South (New Haven), take I-91 North to Exit 10 (Route 40). At end of connector, turn right onto Route 10 North. Proceed straight for 5.1 miles to Country Plaza, which will be on the left. Refer to directions below from **. From points West (Bridgeport/New York), take Exit 61 off the Merritt Parkway. Turn right at end of the exit ramp and proceed on Route 10 North for 6.7 miles to Country Plaza, which will be on the left. Refer to directions below from **. From points West (Waterbury/Danbury), take I-84 East to Exit 26 (Route 70 Cheshire). Bear right at the end of ramp and proceed 2.4 miles to stop light. At light, turn right onto Mountain Road. Proceed 1 mile to Cornwall Avenue and turn left. Proceed 1.5 miles to stop light at intersection of Route 10 South and turn right. Country Plaza will be 1.5 miles ahead on the right. Refer to directions below from **. From I-84 (West Hartford), head northwest on Main Street toward Chapel Street North. Take Homestead Avenue to Albany Avenue. Turn left onto Chapel Street North. Continue straight onto Walnut Street. Continue onto Homestead Avenue. Turn left onto Albany Avenue. Take CT-185 West to Hopmeadow Street in Simsbury. Use the left 2 lanes to turn left onto Hopmeadow Street. Our office is on the right (225 Hopmeadow Street, “Hopmeadow Professional Center”). Refer to directions below from **. From I-91 South (Manchester), take I-91 North and CT-218 West to Gabb Road in Bloomfield. Head south on I-91 South. Take Exit 33 (Jennings Road). Turn left onto I-91 North ramp to Springfield. Merge onto I-91 North. Take Exit 35A-35B (CT-218) toward Windsor/Bloomfield. Use any lane to turn left onto CT-218 West. Turn right onto CT-189 North. Turn left onto Gabb Road. Take CT-185 West to Hopmeadow Street in Simsbury. Gabb Road turns left and becomes CT-178 West. Turn right onto CT-185 West. Use the left 2 lanes to turn left onto Hopmeadow Street. 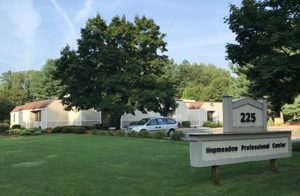 Our office is on the right (225 Hopmeadow Street, “Hopmeadow Professional Center”). Refer to directions below from **. From I-91 North (New Haven), take I-91 North from Exit 2 (Hamilton Street/South Wallace Street). Head south on I-91 South. Take Exit 2 (Hamilton Street). Turn right onto Hamilton Street. Turn left onto Chapel Street. Turn left at the first cross street onto South Wallace Street. Turn left onto Ives Place. Use any lane to take the ramp onto I-91 North. Follow I-91 North and CT-9 North to State Highway 508 in Farmington. Take Exit 39 from I-84. Merge onto I-91 North. Take Exit 22-22N-22S to merge onto CT-9 North toward New Britain. Continue straight on CT-9 North. Use the left lane to take Exit 32 (I-84 West toward Waterbury). Merge onto I-84. Use the right 2 lanes to take Exit 39 toward Farmington/CT-4. Take CT-10 North to US-202 East in Simsbury. Continue onto State Highway 508. State Highway 508 turns slightly right and becomes CT-4 West. Turn right onto CT-10 North. Use the left 2 lanes to turn left onto US-44 West. Turn right onto US-202 East. Our office is on the left (225 Hopmeadow Street, “Hopmeadow Professional Center”). Refer to directions below from **. From the Merritt Parkway (Bridgeport), follow CT-15 North, CT-8 North, and I-84 East to State Highway 508 in Farmington. Take Exit 39 from I-84 East. Head east on CT-15 North. Take Exit 52 (State Route 8 North) toward Waterbury. Merge onto CT-8 North. Take Exit 31 to merge onto I-84 East toward Hartford. Keep right at the fork to stay on I-84 East. Use the left lane to take Exit 39 toward Farmington/CT-4. Take CT-10 North to US-202 East in Simsbury. Continue onto State Highway 508. State Highway 508 turns slightly right and becomes CT-4 West. Turn right onto CT-10 North. Use the left 2 lanes to turn left onto US-44 West. Turn right onto US-202 East. Our office is on the left (225 Hopmeadow Street, “Hopmeadow Professional Center”). Refer to directions below from **. From I-84 East (Waterbury), follow I-84 East to State Highway 508 in Farmington. Take Exit 39 from I-84 East. Head west on I-84. Take Exit 18 (West Main Street/Highland Avenue). Keep right to continue toward Highland Avenue. Turn right onto Highland Avenue. Turn left to merge onto I-84 East toward Hartford. Keep right at the fork to stay on I-84 East. Use the left lane to take Exit 39 toward Farmington/CT-4. Take CT-10 North to US-202 East in Simsbury. Continue onto State Highway 508. State Highway 508 turns slightly right and becomes CT-4 West. Turn right onto CT-10 North. Use the left 2 lanes to turn left onto US-44 West. Turn right onto US-202 East. Our office is on the left (225 Hopmeadow Street, “Hopmeadow Professional Center”). Refer to directions below from **. **We are located in Suite 700. Your doctor will meet you in the waiting area. From I-84 (West or East), take Exit 55 (Route 2 East/Norwich). Take Exit 7 (Route 17/Portland) on the left. At light this enters into Main Street. Colonial Building is on left, 1420 Main Street, Suite 203. Take left into 2nd driveway (far side of building.) Refer to directions below from **. From Norwich or Manchester, take Route 2 (Hartford-West) to Exit 10 (Route 83/Country Club Road/Manchester Road). Turn left at stop sign at end of exit. Go over the highway and take a right turn at stop sign (“T” in road) onto New London Turnpike. Turn left at light onto Chestnut Hill Road. Travel through residential area and turn right at light onto Main Street. After passing The Old Cider Mill on left, travel past Overlook Road on right. As road splits, our office building will be on right. Turn right into first or second driveway. Refer to directions below from **. From Durham and points South, take Route 17 North through Portland and South Glastonbury. Travel past traffic light in South Glastonbury (Mobil Station on right), through traffic light at Red Hill/Chestnut Hill, and past The Old Cider Mill on left. Travel past Overlook Road on right. As road splits, our office building will be on right. Turn right into first or second driveway. Refer to directions below from **. **We are located at the front of the 2nd floor, in the front of the building (same location as Drs. Owitz and Garvin). Your doctor will meet you in the foyer/waiting area. For evening appointments, park and enter at rear of building.